Detective Sean Franks poses with City of Delaware Police Chief Bruce Pijanowski after receiving the Officer of the Year award on Feb. 20. 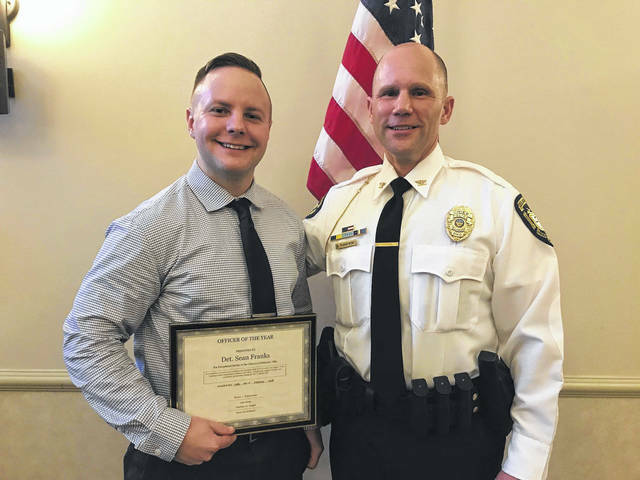 It didn’t take years of police and detective training for City of Delaware Detective Sean Franks to know something was afoot when he saw his parents at the Delaware Police Department’s awards ceremony on Feb. 20. Franks said he was surprised and honored when he was given the “Officer of the Year” award by City of Delaware Chief of Police Bruce Pijanowski at the awards ceremony. Franks has been with the police department for five years and was recently moved to the detective division in January. Franks said he has also been a member of the Delaware Tactical Unit, Delaware County’s multi-agency SWAT team, for the last three years, and said he was thrilled that he will be allowed to stay a member of the team even though he’s a detective. Franks said being chosen for the award was very gratifying. https://www.delgazette.com/wp-content/uploads/sites/40/2018/02/web1_Franks.jpgDetective Sean Franks poses with City of Delaware Police Chief Bruce Pijanowski after receiving the Officer of the Year award on Feb. 20.